Roman Flags There are 16 products. Banner Legio XXII Roman Deiotariana of 75x115 cms. with 4 ribbons of fabric on the ends for tying. The Legio XXII Deiotariana was recruited by Deyotaro, an ally of the roman general Pompey. This banner belongs to the series of Banners that are dedicated to the Roman Legions more popular. Banner Legio II Traiana Fortis Roman 75x115 cms. with 4 ribbons of fabric on the ends for tying. The Legio II, Second Legion Traiana Strong, was levied by the emperor Trajan. 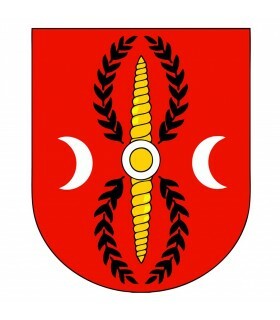 Its symbol was the God Hercules. This banner belongs to the series of Banners that are dedicated to the Roman Legions more popular. Banner Legio IV Flavia Felix Roman 75x115 cms. with 4 ribbons of fabric on the ends for tying. The Legio IV Flavia Felix, Fourth Legion flavia lucky, she was recruited by the emperor Vespasian to replace the Legio IIII Macedonica. This banner belongs to the series of Banners that are dedicated to the Roman Legions more popular. Banner Legio V Roman Alaudae of 75x115 cms. with 4 ribbons of fabric on the ends for tying. The Legio V Alaudae took an active part in the wars of imperial rome. This banner belongs to the series of Banners that are dedicated to the Roman Legions more popular. Banner Legio V Macedonica Roman 75x115 cms. with 4 ribbons of fabric on the ends for tying. The Legio V Macedonica, with the bull as a symbol, was acuartelada in Macedonia during much of its existence. This banner belongs to the series of Banners that are dedicated to the Roman Legions more popular. 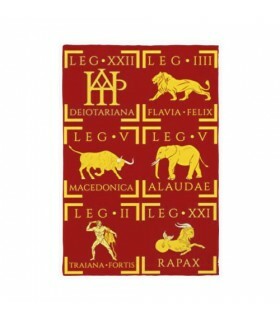 Banner Legio XXI Rapax Roman 75x115 cms. with 4 ribbons of fabric on the ends for tying. The Legio XXI Rapax was a roman legion created by Caesar Augustus and his symbol was the capricorn. This banner belongs to the series of Banners that are dedicated to the Roman Legions more popular. Banner Legio I Germanica Roman 75x115 cms. with 4 ribbons of fabric on the ends for tying. The Legio I Germanica took its name from the legion of Augustus. It was created by Julius Caesar to fight in the Civil War he had with Pompey. This banner belongs to the series of Banners that are dedicated to the Roman Legions more popular. Banner Legio I Parthica Roman 75x115 cms. with 4 ribbons of fabric on the ends for tying. The Legio I Parthica, was founded by the emperor Septimius Severus and was in force until the beginning of century V. This standard belongs to the series of Banners that are dedicated to the Roman Legions more popular. Banner Legio II Adiutrix Roman 75x115 cms. with 4 ribbons of fabric on the ends for tying. The Legio II Adiutrix Pia fidelis, faithful and loyal servant, she was recruited by the Emperor Vespasian, and remained until the beginning of the fourth century. This banner belongs to the series of Banners that are dedicated to the Roman Legions more popular.